The famous word Sherry comes from “Sherish”. That’s the name that the Muslims gave to the city of Jerez, as we know it today. Sherish was one of the most important towns of Andalusia towards the last stages of the Muslim occupation, when it experienced an important growth. The city saw another splendorous period with the fast increase of its wine exports in the 18th and 19th century. The oldest quarters of Jerez keep their charming Moorish urban planning inside the city walls, that were built in the 12th century. This tour will take us through the narrow winding streets of the former Muslim medina and to the unique quarter that first developed outside the walls. 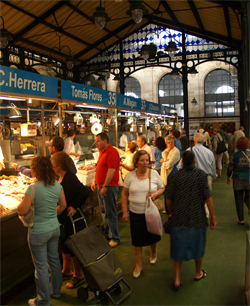 Along the way, we will see the lively atmosphere of Jerez’s old town. We will also see evidence of the transformations (religious, social and architectural) that the city went through after the Christian conquest and centuries later with the Sherry export revolution, until becoming what it is today. A most important part of this tour is food and of course Sherry. We will take a few stops throughout our itinerary to understand and experience the important role that food and wine play in the local culture and economy. We will have a typical Andalusian breakfast before starting our tour. We will visit a unique Sherry bodega where we will do some tasting. We will venture into some genuine bars serving quality tapas and of course we won’t finish the tour without a sweet treat we’ll get in a unique shop. This tour is ideal for people willing to see and experience the most local aspects of Jerez optimizing their time or for those who want to deepen into the local culture of the city after having watched the breath-taking horse show in the Royal School of Equestrian Art. Meeting point: Plaza del Arenal, by the big statue in the centre of the square. We can also meet you at your hotel if you are staying in Jerez or at the train station if you are coming by train to Jerez to spend the day. Prices: start at 78 Euros per person (incl. VAT) for a group of 8 people. Includes: your personal local expert throughout the itinerary, breakfast, all entrances, Sherry tastings, 4 – 5 tapas with their corresponding pairings and a sweet indulgence to finish. Excludes: further tapas or drinks not mentioned above.